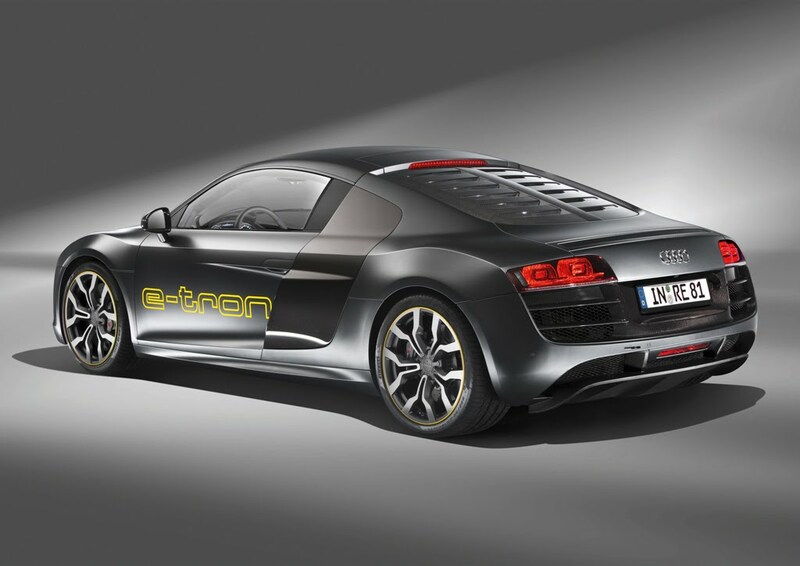 Of Audi's three electromobility vehicles revealed today, the Audi R8 e-tron is by far our favorite. 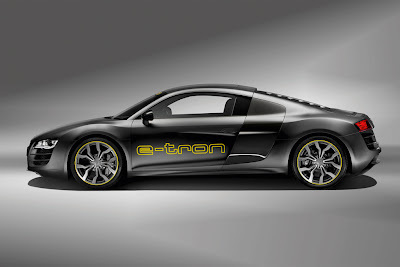 We're most happy to hear that Audi will be releasing the R8 e-tron as a limited edition production vehicle in late 2012. After the jump, Dr. Michael Korte, Head of Pre-Development - Vehicle Concepts, explains everything you need to know about Audi's production electric supercar. The Audi R8 e-tron is a high-powered sports car with a purely electric drive. Its four engines provide a total power of 230 kW (313 hp) for splendid driving performance. They can be individually actuated – for an entirely new developmental stage of the permanent four-wheel drive. The four asynchronous motors – two each on the front and rear axles – make the Audi R8 e-tron a quattro. Power is transmitted to the wheels via the single-staged transmission and short input shafts. With a peak output of 230 kW (313 hp) and with up to 4500 Nm (3319.03 lb-ft) torque at the wheels available from a standstill, the R8 e-tron delivers breathtaking driving performance. It catapults from 0 to 100 km/h (62.14 mph) in just 4.8 seconds. The technology demonstrator enveloped by the R8 belongs to the top league of electric sports cars. Its package does justice to the specific qualities of the new technology in all details. The large, fluid-cooled lithium-ion battery and the power electronics, for example, lie directly behind the passenger compartment. The result is an optimal center of gravity and a load distribution of 42:58 between the front and rear axles – just like the series production R8 with its 5.2 liter FSI. For recharging the battery a household current with 230 volts suffices; the process takes six to eight hours for a fully discharged battery. A high-voltage current will reduce the charging time to about two and a half hours. Thanks to recuperation the battery of the Audi R8 e-tron is also recharged on the road during the braking and deceleration phases – the four electric motors are able to recover a considerable part of the energy. 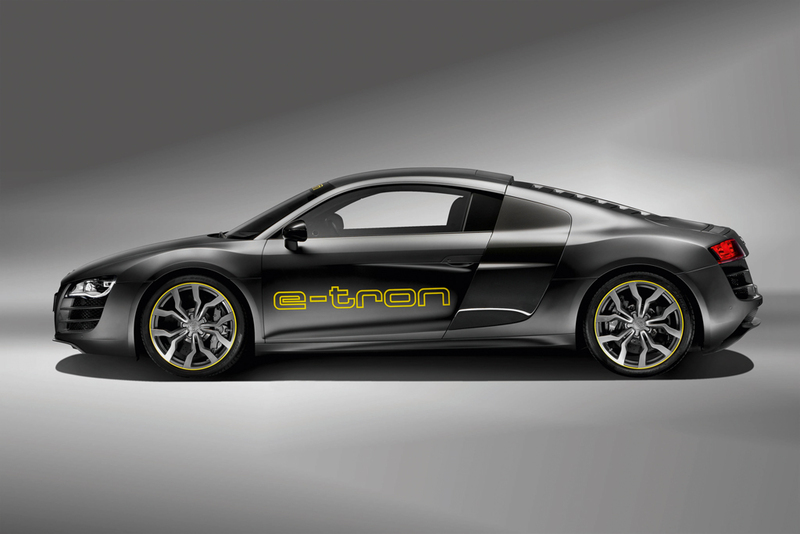 The distribution of the electric drive torque in the R8 e-tron distinctly favors the rear axle. Like the standard Audi R8, about 70 per cent of the power acts at the rear in regular operation, with the remaining 30 per cent going to the front wheels. Should slip occur at an axle, this balance changes in a fraction of a second – so that the electrically driven high-powered sports car embodies the fundamental strength of quattro technology. The running gear employs double triangular control arms at the front axle and trapezium links made of forged aluminum components at the rear axle – a configuration that has proven its merit in motor sports as an optimal layout for high dynamics, maximum precision and exact intrinsic steering behavior. Notwithstanding the firmness of the springs and shock absorbers, they still afford good comfort. The rack and pinion steering with its direct gear ratio provides finely differentiated feedback. The steering is electro-mechanically assisted depending on the speed. The Audi R8 e-tron rolls on 19 inch wheels. A consistently lightweight design is a crucial precondition for efficiency and range, especially among electric cars. For the R8 e-tron Audi engineers exploited one of the company’s core competences: the body is aluminum; designed with Audi Space Frame technology (ASF), it weighs less than 200 kg (440.92 lb). 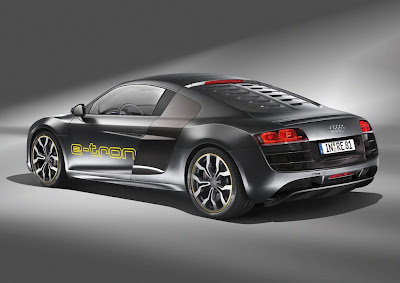 The lightweight body is an important reason why the Audi R8 e-tron weighs in at just 1600 kg (3527.40 lb). 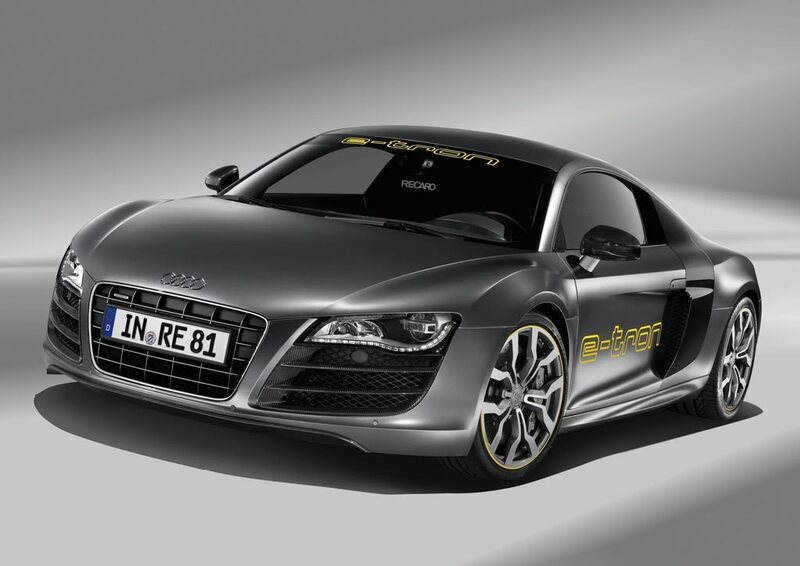 Audi will be bringing a limited edition of the R8 e-tron to the roads in late 2012. It will be built at quattro GmbH in Neckarsulm, which has extensive experience in the construction of exclusive sports cars.